We have extended the deadline for the special issue of Water on Coastal Resource Economics and Ecosystem Valuation to May 3, 2019. We currently have several manuscripts under review and would welcome your submission prior to the deadline. If you are planning to submit, please let me know if you have any questions. The ‘Instructions for Authors’ on the webpage link below provides further information. Thank you. Coastal areas around the world are dynamic environments at the interface of terrestrial, marine, and freshwater systems. Nearly 40% of the world’s people already live in these areas, yet coastal zones are increasingly attractive for development and tourism, and are vulnerable to a variety of impacts from land use, water management, nutrients, invasive species, extreme weather, sea level rise and oil spills, among others. 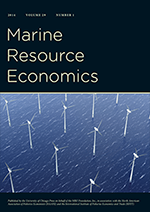 This Special Issue will focus on original research into the application of economic valuation methods to understand and measure the contribution of coastal resources and ecosystems to human well-being. These resources include, but are not limited to: estuaries, beaches, wetlands, shores, mangroves, seagrasses and salt marsh, coral reefs, and essential fish habitat. Valuation methods include the full range of methods: stated and revealed preference, hedonic pricing, bioeconomic models, and habitat equivalency analysis. The goal is to provide meaningful information for policymakers and resource managers about the economic significance of coastal resources for planning and restoration. We welcome papers from researchers around the world to provide a broad international perspective on new developments in this area.